On the surface, Say The Time looks like a pretty simple application. The objective of my review is to see whether it lives up to its claim of helping users get organized in a fun and easy way. The installation file is 3.73MB and would download within seconds for those with broadband internet connection. The download speed is decent and after a quick virus scan, I was installing Say The Time. The installation process is pretty straight-forward and basically, you just need to confirm whatever step is prompted by the installation software and Say The Time would be installed on your computer. A funny incident I encountered in the installation process was the need to restart my computer after the installation is complete. I haven’t needed to do that since I installed Visual Studio .NET, a programming IDE by Microsoft. I doubt that Say The Time is such a complex application that it warrants a reboot. Perhaps the next version should address this issue. Rebooting is not fun, especially after an installation of such a simple application. After my PC rebooted, I saw that Say The Time launches at startup. Its presence is obvious. Where the standard Windows clock used to be is now replaced by Say The Time. The default look is not really suited to my tastes. However, it’s easily customizable and within seconds I’ve manage to change it to exactly how I wanted it to be. I proceed to test the Reminders function of Say The Time. The first thing I noticed was that the window has two tabs namely Reminders and Notes. I switched between the two tabs and the title for the window changed according to which tab was selected. I find this to be a useful time-saving function whenever I wanted to switch between the two. 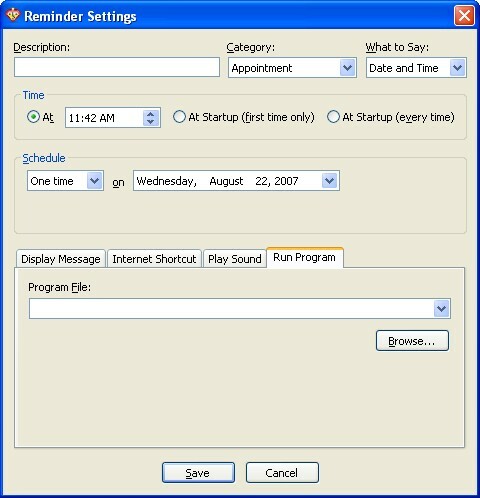 However, the right-click menu of Say The Time shows two separate functions called Reminders and Notes that bring up the same window although the selected tab is different depending on what you’ve selected. Personally, I think it’s better to just have one menu item called Reminders and Notes instead. Basically, I’m spoiled for choices on how I choose to be reminded! Almost all of the options work as expected. The only minor disappointment I have is that the sound playing reminder only accepts WAV files. It would be much better if it can also at least support MP3s. I then experimented with the Notes feature. If the Reminders function has a wealth of features, the Notes function is almost a total opposite. Basically, you have a small Post-It like window appear where you can type in some text. You can also change the background colour of a note, as well as setting a transparency level. 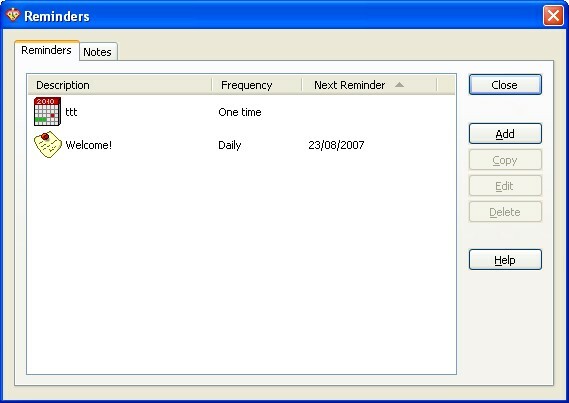 Additionally, you can even make a note stay on top of other windows. I’m disappointed that the font control is pretty weak. You can only change the font settings for the entire note content. It would have been nice to be able to mix underlined, bolded and italicized content in a note. It would also be nice if I can embed pictures in them. The next function of Say The Time I tested next was the Stopwatch. It’s a straightforward function to use. You simply need to start and end the stopwatch according to what you’re timing. I did notice one bug in this function; namely the millisecond counter is essentially useless. It doesn’t really measure milliseconds properly. Nevertheless, you can omit the milisecond reading. If you really need to measure time up to the millisecond, then Say The Time‘s stopwatch just won’t cut it. 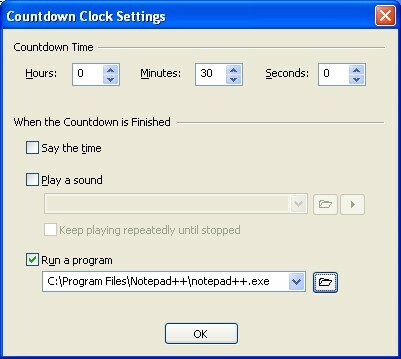 The Run a program function is pretty nifty if you want to schedule a program to run after a certain period of time. This by itself will easily be a useful function for an internationally traveling businessman. Although I’m not one, I love this feature too because I maintain and access a couple of servers around the world. With this function, I can know easily what the time is where they’re located. 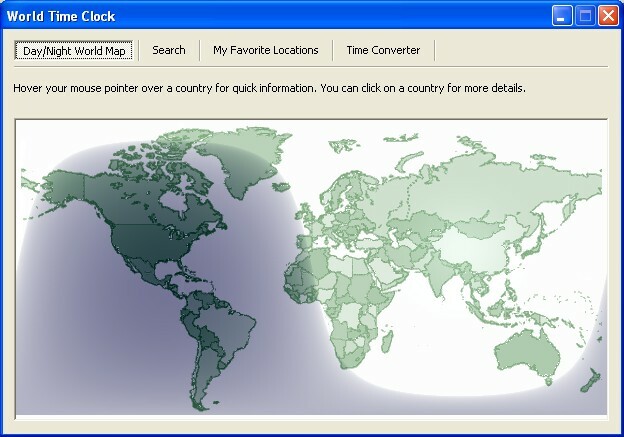 With Say The Time, you’ll always be able to synchronize your PC clock with time servers around the world and ensure that your PC clock is always accurate. Why? 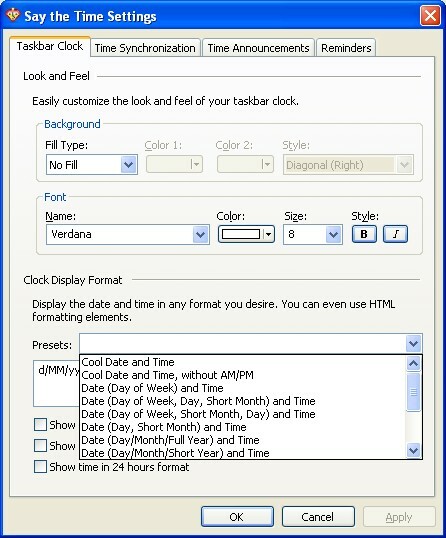 Not only is Say The Time a productivity tool, it is also an atomic clock software download. At US$24.95, Say The Time is a bargain if you’re looking for a better way to get things done within deadlines. This is a great deal because not only do you get a useful time management tool, you’ll also get free updates for a year in addition to free customer service and technical support. I’m hoping to clinch a deal with Provenio, the makers of Say The Time, to get a special deal for HTNet readers. I’ll update this post if we manage to work something out. I’ve managed to get a good deal for you, check out the update below. In the meantime, why not just download Say The Time and give it a whirl? The download is a 30 day trial and it should give you enough time to play around with it before making your purchase decision. Update: Save US$5.00 off the purchase price of Say The Time by using the following coupon code: HTNETSAVE5. That’s more than 20% savings!